Inside the pages of a storybook - anything can happen! You'll find frog princes, magical fairies and dastardly dragons! 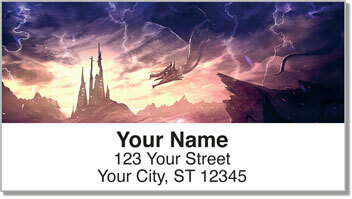 Some colorful characters from "Once upon a time in a land far, far away..." make for an original set of return address labels. Dream up your own story about why the pretty pixie is riding a grasshopper next to the smiling frog atop a warthog. One thing is for sure - the story will end with everyone living happily ever after! 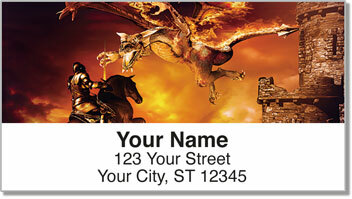 Castle Happening Address Labels are not only unique, they are also convenient. 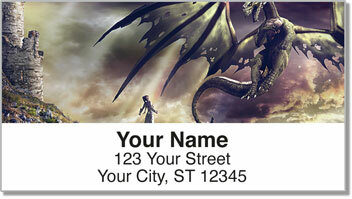 Stick them on all your letters and packages to save a ton of time when preparing outgoing mail! No wizardry required! 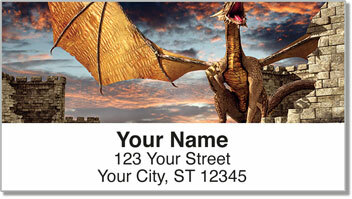 Get your very own Castle Happening Address Labels today! Order them with matching personal checks.